The rehearsal and recording started at 15:30 and ended at 24:00 on 3rd June 1971. Geoffrey Alexander takes the lead vocal on 'Almost Grown'. George Underwood takes the vocal for 'Song For Bob Dylan'. Dana Gillespie takes lead vocal for 'Andy Warhol'. For 'It Ain't Easy' David Bowie sings the first verse, Geoffrey Alexander sings the second and George Underwood sings the third. 'Oh! You Pretty Things' was also recorded but dropped from the broadcast due to time restrictions. The one hour long programme was broadcast on 20th June 1971 on Radio One at 19:00 until 20:00. The programme number was TLN 22/IEI311 Q. The broadcast was repeated again on the 23rd June 1971. 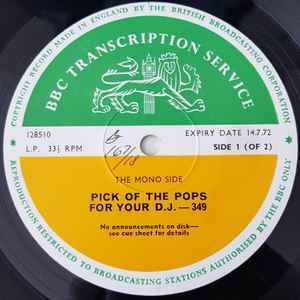 Unfortunately the original master tape to this session has been lost by the BBC and is now no longer on archive.